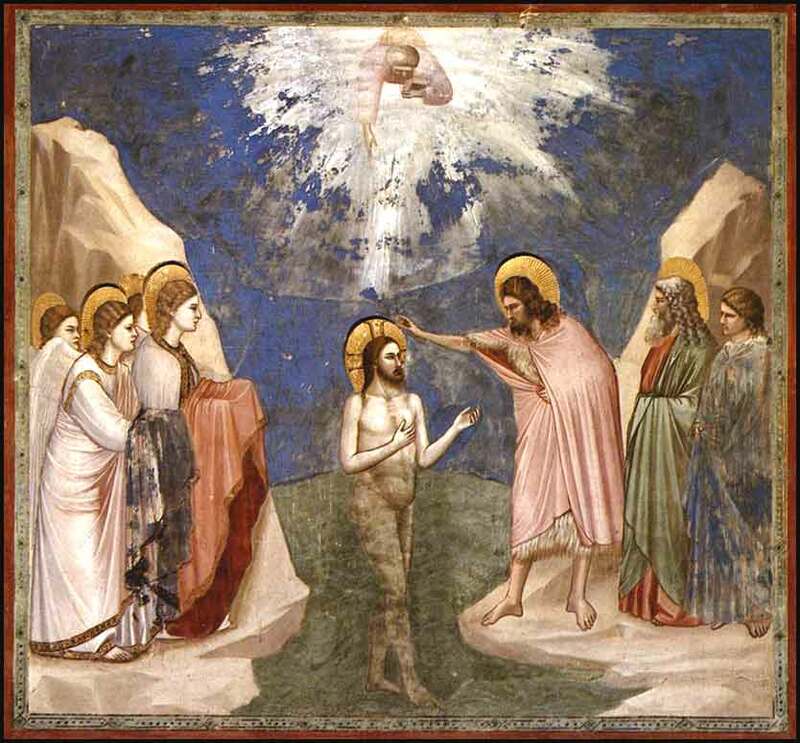 The Baptism of Christ by Giotto, ca. 1305. One of the finest works of the genius who invented Renaissance art. Fittingly, it was painted as a fresco in a little Romanesque church, the Scrovegni Chapel in Padua, one of a series of panels on the life of Christ. Heavenly Father, blessed my loved ones who have passed from this life. Grant them mercy and peace; lead them to your loving embrace. And bring comfort and the consolation of hope to me, and to all who grieve for the dead. I thank you, Lord, for the grace to move me through the challenges of this life and, especially, to look beyond death with faith and hope, to the new life you have promised. 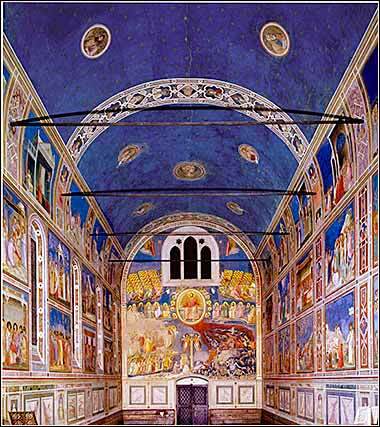 The interior of the tiny Romanesque church (The Scrovegni Chapel) where Giotto revolutionized the world of art @ 1305. The world does not consist of 100 percent Christians and 100 percent non-Christians. There are people (a great many of them) who are slowly ceasing to be Christians but still call themselves by that name: some of them are clergymen. There are other people who are slowly becoming Christians though they do not yet call themselves so. 2-4 I only want you to tell me one thing: Did you receive the Holy Spirit by keeping the Law, or by faith, from hearing and believing the Gospel? Do you really intend to rely on your flesh, which could not begin your salvation, to perfect it? It would be insanity. Would you simply throw away the benefits of the tribulation you have suffered? 5 You have seen miracles worked in you, and you have known the presence of the Spirit. Did this come about because you relied on works of the Law, or because you relied on faith? 2 this only I desire to learn from you, by aOr from. works of law the spirit you received or by hearing of faith? 3 So ignorant are you having started in spirit bAmbiguous. This could mean the Holy Spirit, or the spiritual nature of the believer. Both are grammatically correct and theologically sound. now in flesh you complete cOr finish. The concept of completion in Greek often carries a connotation of success and/or perfection, as it does here. (The sarcasm should thus be evident.) ? 4 So much you suffered in vain? If indeed in vain. 5 So, the furnishing dOr (he) who furnishes. The phrase could refer to either the act of giving or the person who did the giving. We would say “the Giver” for the latter meaning in English. We can just barely use a participle in English as a noun characterizing a person by an action; we could understand “The Sinning will be judged” but we would prefer “Those who sin” or “The sinner”. This brings up a rather complex issue of translation. Put as simply as possible: Most translators (even in “literal” translations) become habituated to treating noun participles, such as “the giving”, as a relative pronoun and finite verb, such as “who gives”, and then implying a subject if needed. They are not necessarily wrong in doing so, either. But I think they get so used to doing it, that the possibility of translating these constructions literally never occurs to them. In this case, for example, “the act of furnishing” (as opposed to “(he) who furnishes”) is a valid translation and changes the meaning, but the possibility appears to be overlooked by most. See the General Note on translating Greek participles. eThis is a compound verb, whose component roots literally mean “to lead a chorus”; and in fact, this is what it originally meant. But it came to mean “sponsor a chorus,” i.e. supply the funds for it, and over time became broader in meaning, to the point where it can be translated simply “to give” or “to furnish”. Even so, the verb carries overtones of a public or charitable service being rendered, and also, a sense of an abundant gift. to you the Spirit and working miracles in you from fOr by. See following note. works of law or from hearing by gOr in, or with. Prepositions are so inexact in this regard that they must be supplied by context. The temptation for a translator to supply a preposition that fits a preconceived notion is correspondingly strong. faith. We have been looking at almost the same short passage of Galatians for four days, but now we have the payoff: The fundamental contribution of Paul to Christian theology, which begins here in Galatians. Although it was the rallying cry of Martin Luther and the Reformation, it is now accepted by every Christian denomination: “Salvation by faith”. Although he never comes right out and says it, we can infer with reasonable assurance exactly what the false gospel was, that Paul so vehemently cursed in Galatians 1: the teachings of a sect called the Judaizers, who believed that all Christians had to become Jews. This involved both physical circumcision (for men) and obedience to the Law of Moses (for all). If we find this strange, we must remember two things about the early church. First, as far as we know, it did not have a written Gospel. The Gospel of Mark, the first one written, was almost surely finished many years after this epistle, and even then, it would be a long and labor-intensive process to have it copied and delivered to the various churches. To the early Christians, “Scripture” was the Jewish Scripture, our Old Testament. Secondly, Jesus was himself a practicing Jew. He was circumcised and celebrated the festivals, as far as we know, exactly according to the Law. Moreover, since the Law of Moses was (and is) the actual Law of God, we might infer that Jesus followed it perfectly, and was the only human being ever to do so. Saying He was justified before God by the Law, however, would be going too far. As the Son of God, He needed no justification; He was guilty in the eyes of men, but innocent in the eyes of the Father, simply by virtue of the identity of His person. But more importantly, Jesus' most prominent human characteristic was His faithIn fact, the faith of Jesus is arguably the key to our salvation. We have discussed the ambiguity of the concept “faith in Christ” (the pistis Xristou problem) in footnotes, and sooner or later we will have to devote a Devotion to it. But for now, realize that “faith in Christ” may not mean what it sounds like, but may actually refer to the faith “of” Christ. . All of the Gospels, and especially John, make this emphatically clear by their descriptions of the time spent in Gethsemane preceding the crucifixion. (. The initial and pre-eminent requirement for salvation is faith. Faith occurs in our spirit. It is a relationship with God of total trust and a desire for obedience. We can be good people, apparently perfect in our conduct, devoting our lives to others in utter humility and total love; but God will still see us as sinners, unless we have faith in Him. Isaiah 26:5: The Lord humbles those who dwell on high and lays the lofty city low; He levels it to the ground and casts it down to the dust.